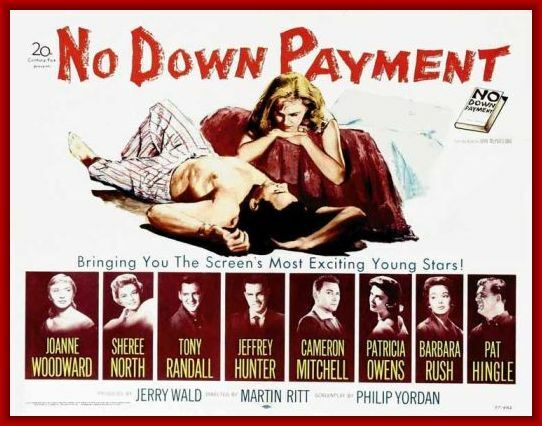 The Lady Eve's Reel Life: Guilty Pleasures Movie Blogathon: "No down payment is the secret of prosperity..."
So begins Martin Ritt’s second feature film, No Down Payment (1957), a slice of suburban realism generously spiced with melodrama. An ensemble cast portrays four neighboring couples who’ve staked their claim to the American Dream in Sunrise Hills. Pat Hingle and Barbara Rush are the Kreitzers (Herm and Betty), an easygoing pair, he manages the local appliance store, she’s a housewife. Tony Randall and Sheree North are the Flaggs (Jerry and Isabelle), he’s a boozy car salesman with get-rich-quick fantasies and she’s a housewife. 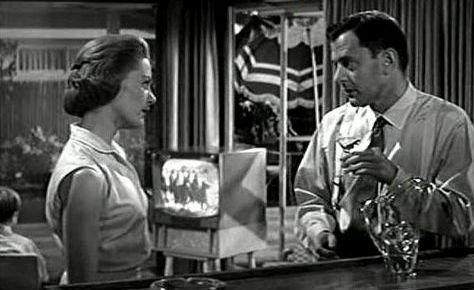 Cameron Mitchell and Joanne Woodward are the Boones (Troy and Leola), he runs a service station and aspires to be police chief – and she’s a housewife. Jeffrey Hunter and Patricia Owens are the Martins (David and Jean), the couple in the Chrysler, newlywed and new in Sunrise Hills, he’s an electronics engineer and, yes, she is a housewife. Ben Maddow’s adaptation (fronted by Philip Yordan) of John McPartland’s breakthrough 1957 novel is, under Ritt’s direction, a combination of grit and soap that mostly works, sometimes doesn’t, but has always intrigued me. It’s a high-drama trip into a particular era in a place close to home. No Down Payment takes place north of my hometown, most certainly in that part of L.A. known as “The Valley,” aka/the San Fernando Valley, the city’s now enormous bedroom community. 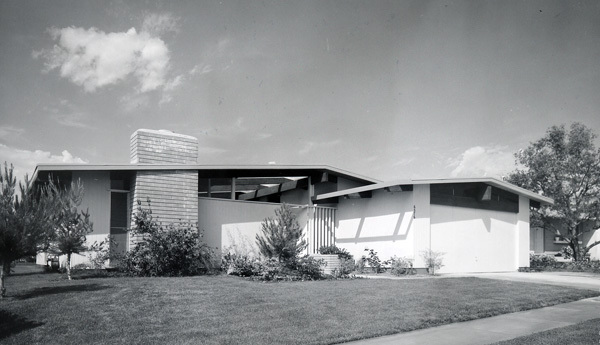 On the heels of World War II production and the post-war boom with its VA/FHA home loans, The Valley experienced a population explosion so powerful that by 1960 its citizenry numbered more than a million. As the Martins make their way through the streets of Sunrise Hills to their new home, we get a glimpse of the housing development. From the curb, the houses and yards appear identical. As the plot advances, we see that they are the same inside and out – stucco, wood, glass and brick ranch homes with high windows facing the street and floor-to-ceiling glass and sliding doors facing backyard and patio. Standard issue includes a fireplace, kitchen nook, bar - and a console TV with a young tot or two rooted in front of it. Once the Martins step into their house for the first time they kiss happily, then passionately. Surveying their patio and backyard they meet the Kreitzers, whose yard abuts theirs. “Hi...welcome to Sunrise Hills,” calls Betty. David and Jean are quickly invited to a backyard barbecue that night at the Kreitzers. Just as Herm promised, there are “steaks on the fire” and, over stiff drinks, the new couple meets their other nearby neighbors, the Flaggs and the Boones. Isabelle Flagg is enthusiastic about the area, “Sunrise Hills is just the living end,” she chirps. Troy Boone mentions “saving green stamps.” But Jerry Flagg, several drinks ahead of the others and bursting with irony, observes that everyone in the subdivision is “only 25 years in debt.” The men talk about the contrast between Depression era life and the present. Having endured World War II, the post-war age seems secure and comfortable and David Martin crows, “I think we were born at the right time…we’re here now and everybody’s doing great!” David served at Los Alamos during the war. Music drifts from the stereo and soon dancing begins. Lecherous Jerry makes moves on refined Jean as they dance, and David watches uneasily from the sidelines. Troy, a proud war hero, cuts in and saves her - after which Isabelle and Jerry argue and, as the group looks on, she slaps him across the face. A night or so later the Flaggs, reconciled once more, throw a neighborhood cocktail party; Jerry has made a sale and insists on celebrating. It’s the same four couples, together again. By now we know that Troy and Leola are hicks from the Deep South (Jerry calls them “Daisy Mae and Li’l Abner”). 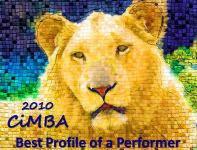 Troy is ambitious and quick to anger, Leola is sweet but erratic. We’ve learned that Herm is the rock of the community and that he and Betty are a simpatico pair. We’ve seen Jerry drink in nearly every scene – as Isabelle worries and frets either in a corner or in his face. David and Jean are deeply in honeymoon love – but she is pressing him to move into a better paying job. The tension in this microcosmic enclave continues to build. Herm and Betty grapple with confronting discrimination; one of Herm’s key employees, a Japanese-American man, has asked him to challenge the whites-only imperative of the Sunrise Hills developers. Jerry, who bent the rules to make a sale, is out of a job and on the verge of being thrown out of his house by fed-up Isabelle (classic lines: Isabelle in a frustrating heart-to-heart with Jerry: “You’re the man, you’re supposed to know what to do!”; Jerry’s view, “All our troubles boil down to one thing – money – how to get a bundle of it!”). Troy and Leola have had a volatile life together from the start and things only gets worse when she drinks - and then, worse still, he doesn't get the job he's been counting on. David, responding to an implied ultimatum from Jean, goes on a sales trip; his timing couldn’t be worse. While he’s away, one neighbor’s bout with a bottle and a belly full of resentment turns ugly and violent. In 1957, Tony Randall wasn't yet completely typed as a comedic actor. His energetic turn as desperate Jerry Flagg, a man of extreme moods and desires, is an eye-opener. Cameron Mitchell oozes barely contained fury as Troy who yearns for the glory and respect that was his during the war. Pat Hingle is engaging as an honorable everyman, self-possessed but not immune to the pressure to march in step. Though top-billed Joanne Woodward offers tender and thoughtful moments of subtlety, she also overindulges in occasional histrionics (bringing to mind the high-strung heroines of Tennessee Williams). Even with its excesses, No Down Payment is potent commentary on the suburban culture it dramatically depicts. To be honest, I'm not sure my pleasure in it is all that "guilty" anymore. Click here for a link to the full list of blogs participating in the Classic Movie Blog Association's Guilty Pleasures Movie Blogathon. Click here to learn more about forgotten writer John McPartland, the author of No Down Payment. Eve, I haven't seen NO DOWN PAYMENT, but it sounds like the kind of the movie I would definitely enjoy. As you know, I'm a big fan of the late 1850s/early 1960s Hollywood melodramas. However, I'm already struggling the two of the pairings: I can't imagine Barbara Rush and Joanne Woodward as the spouses of, respectively, Pat Hingle and Cameron Mitchell (forever "Buck" from THE HIGH CHAPARRAL to me). Yet another great review, Eve. I haven't seen this, but it sounds like something I might enjoy. As a history professor I am always looking for films that might serve as good examples of the time period in which they were made. BTW, I think Woodward and Tennessee Williams were made for one another. LOL! I haven't seen this in years. In fact, for a number of those years I couldn't even recall the title - only the characters. For a movie to make that much of impression, it must have a lot going for it and I found that in your description of the performances. Interesting choice and wonderful article. I love that you mentioned two of my very favorite 50's/60's Era movies in the same sentence! And here I thought I was the only one who loved them both, although they couldn't get further apart in theme or content! NDP by the way is now posted at least twice on YouTube in case you hadn't found it yet, or someone else coming here wants to find it! I have both of them in my Favorites list, in case one of them disappears, like the third posting of it has. Eve - that cast brings tears to the eyes of someone of a certain age. And - funny how all those women aspired to the same career, isn't it? 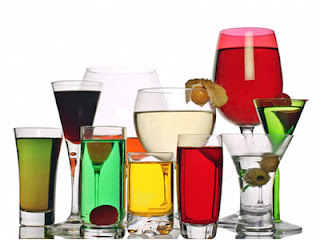 A terrific post and one thing I think we will all get out of this blogathon - we needn't feel guilty about our secret pleasures - we all have good taste! Rick, Caftan Woman, Paul and Kim - I happened to record this on HBO a month or so ago - otherwise, I don't think it's easy to find. I couldn't find so much as a clip on YouTube or Hulu. Maybe Netflix? Definitely worth seeing more than once. I'd remembered NDP as a So. Calif. suburban potboiler par excellence, but in my repeated viewings for this post I realized it's a stronger movie than I'd thought. I love it! No guilt! This one has always brought back my own memories of that era. Didn't grow up in a tract, but there were builders in the family. And the same kind of barbecues, cocktail parties and melodrama happened outside the area's suburbs. And Kim, this would be a great film for a history class (if you can find it). Even with its overheated moments, it's a penetrating look at the time and place. FlickChick - The cast!! Jeffrey Hunter, almost too handsome, but he turned a steady, low-key performance. Barbara Rush, as well. Patricia Owens had her moments. I've always thought Barbara Rush was so beautiful, but in this one she is very "housewifely." I'm picturing these girls reading Betty Friedan in a couple of years and then - more wild and woolly melodrama in Sunrise Hills! I haven't seen this either, but I sure would like to. It sounds like one of those movies where everything looks so wonderful on the surface, all these tensions are brimming, which erupt as the movie progresses. I like stories like that. Eve, like you I am not so sure this is a guilty pleasure, it's actually a decent enough film which you beautifully describe. No matter, this is nicely done. I caught it on a cable station a few years ago and was pleasantly surprised. 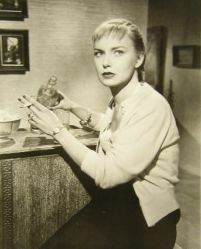 Randall is good in a rare dramatic role and I always enjoy Joanne Woodward's work. It's one of those films that reflect the 1950's and how well everyone is doing in post war America yet once you scrape underneath the surface you find out life is not that grand. Kevin - I think you'd enjoy "No Down Payment." As mentioned, for me, its mix of melodrama and message progressed from "guilty pleasure" to "pleasure" with repeated viewings. There are some great performances and the script is pretty sharp. John - Giving it some thought, I think I looked at NDP as a "guilty pleasure" for reasons beyond its melodrama. It has to do with ancient memories of the era and place of my childhood. Perhaps it seemed a bit like peeking into the private lives of couples my parents knew and socialized with back then. Eve, having had friends and loved ones who lived in tract housing and gated communities, NO DOWN PAYMENT sounds more like a documentary about suburban life in the late 1950s and '60s in certain ways, with its characters' money worries and tensions seething beneath the surface! :-) Great cast, too! I enjoyed the thoughtful way you wrote about these characters and the milieu. Terrific post! You can add me to the list of people who have not seen this film. This film, sounds like It peels off the label of happy family life to what was really going on. Your evocative review of a film linked very much with place and time reminded me that Mad Men, the one pleasure I looked forward to on Sunday nights in summer, decided to go on hiatus for the year. The resulting sense of monotony has engaged my channel surfing mode for the past two months, and I would have been happy to discover No Down Payment as an alternative. Although Mad Men is very much on the glossy end of the spectrum for storytelling, No Down Payment seems like it hits closer to reality (with all its melodramatic charm and prettily colored drinks). 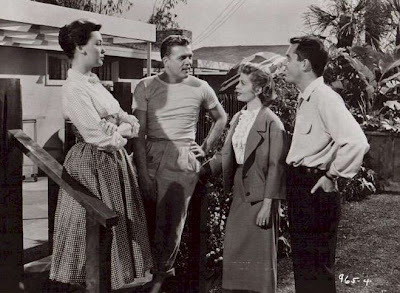 I will definitely add this to my list of films to watch; any tract house that includes Jeffrey Hunter as a neighbor is a place I want to call home. You'll have to put me down in the 'haven't seen' crowd. I've never heard of this film but with the cast and after reading your interesting take on the film I hope I don't have to wait much longer to see it. Gated communities in the 1950's certainly had some interesting things going on behind those gates. This is the second time in three months that I've read about this film, and your review has me wanting to see it even more than before. Insightful as always, and it seems like this film may be ahead of its time. I can't wait to see it. Dawn - "No Down Payment" does look beyond the outward appearances of suburban life in the'50s. I'd say that of the four couples, only two of the marriages survived. It's ending is a bit upbeat in a pat way, though the final shot is of one resident taxi-cabbing out of Sunrise Hills. 'Gypsy - Oh, do I miss "Mad Men" ! It's killing me. I watched Season 4 again last month, but Season 5 can't come soon enough. The creators of "Mad Men" have the advantage of looking back at the '50s/'60s with the knowledge of what came after. Ritt and Maddow were working with emerging issues. In the end though, both deal with the same moral and social themes and questions (NDP is not the least bit glossy, though). Page - Actually Sunrise Hills (and the other communities like it) weren't gated, they were built for the middle class, which was coming into its own then. I hope you have a chance to see it soon. Film Boy - I wonder what people thought of "Now Down Payment" during its release!?! Martin Ritt went on to make "Hud" (another look at the question of moral character) and "The Spy Who Came in From the Cold" (Richard Burton's best work, I think). NDP is early, but Ritt's interests and strengths are evident. Dorian - I think Ben Maddow worked on documentaries earlier in his career. There is an element of documentary in the movie but it's also heavy on the emotional fireworks - and with a cast that can deliver them. Tony Randall really is excellent in his part, but the others more than hold their own. Martin Ritt began his career as an actor and earned a reputation for being an actor's director who liked working with ensemble casts. It shows. I haven't seen this on anywhere in ages - I wonder why. Great cast, story worth the most worthy soap opera -- and with some really good stuff in it. Well, I'm tickled to see it spotlighted here -- guilty pleasure, OK, if we're going to be snobs about it--LOL! Excellent article, Eve. Becky - Actually, originally, I did view it as a guilty pleasure. In my memory, the melodrama outweighed the social/moral themes. I don't see NDP as a 'soap' anymore - it does have that aspect, but the concept, script, acting, etc., outbalance the melodrama. Basically, I changed my mind about the movie after I committed to it for this blogathon. I did quite a bit of editing at the last minute to lighten up my review. I can imagine you'd have to do that. It had some pretty serious stuff in it -- remember what happened to Cameron Mitchell's character? Yikes! Cameron played Jigger in the musical "Carousel" too. I think his career was mainly B movies and character actor things. I always liked him a lot. You've done a fascinating analysis of how this film reflects 1950s suburbia, just on the brink of radical social change. I like how you evoke the era with the scene of the series of billboards encountered on the road by the young couple, it really sets the story of the film. I haven't heard of this movie, but it sounds like strong, interesting drama with a great cast - thanks for your terrific review. GOM - If I recall, at the end of the film, as one of the characters leaves the subdivision in a cab, we see the Sunrise Hills billboard once more and this time notice a slogan at the bottom of the sign: "a happy ending" - "No Down Payment" has it all - drama, melodrama, social commentary, irony (plus, of course, a great cast and crew). Add me to the chorus of people who haven't seen this one -- and I should, because Martin Ritt is one of my favorite filmmakers. On a sidenote, the pickings at this week's Classic Chops were a little lean this week so I linked to this review and about four others from the Blogathon...I hope you get some extra traffic from it, because this is a superbly written review. Ivan - You warm the cockles of my heart (even though I'm not sure what they are) - thank you! I hope you're able to track down the movie, would love to know what you think. Two of the greatest/my favorites from the '60s: "Hud" and "The Spy Who Came in From the Cold." Wow! I have to watch this! Thanks! Hi Java - I hope you can find it! Every so often it turns up on HBO - possibly, too, on the Fox movie channel (it's from 20th Century Fox). I don't use Netflix, so don't know about that. Nothing on YouTube or Hulu. Great review Lady Eve. I'll definetely look for this one. I too grew up in L.A., not in the Valley but my parents had friends there we would visit in the suburban building boom days of the 50s. Thanks for sparking my interest in this film. Thanks, Christian, I'd be very curious about your take on "No Down Payment." I've seen this movie twice...I grew up the the 1950s San Fernando Valley in a tract....does anyone know the location of the tract? I've tried movie location sites, but haven't had any luck. Panorama City maybe? "No Down Payment" location(? ): I recorded the movie on our DVR and still-paused the beginning segment where they are driving past the billboards. The road names were real: Harbor Blvd, Grand Ave, Lincoln Ave, La Palma... all off Rte 39. I found a location near Knotts Berry Farm that seemed to have older houses. I used the Google Maps "man" and "drove" down various streets to view the houses and they looked very similar to the style in the movie. Haven't yet compared these street-view images to the movie images (will take some doing!) but it could be the town of Buena Park, CA. I had also watched "Bachelor in Paradise" and couldn't find any Katherina Street in California (the place Bob Hope rented from Lana Turner). "No Down Payment" location was easier to find because that billboard mentioned "Santa Ana". Thank you for going to such lengths to research and pin down the actual locations used to depict "Sunrise Hills" in No Down Payment. I know Santa Ana is in Orange County (I once lived in Corona del Mar and occasionally went to the movies in Santa Ana) - it's hard to believe the area was ever that new and empty-looking. You've inspired me to open Google Maps and take a look for myself. Thanks again! Fox Studio, in West L.A. There are several neighborhoods in that area that were new, and they could have used at that time. I am enjoying reading through your blog and the other comments made about this wonderful movie. It's also one of my favorite movies and I have managed to find it posted on YouTube! I was fortunate enought to watch it on the Late Show one night years ago, and also recorded it another time it was shown, on VHS tape! I don't know if it will even play anymore, because my VCR is no longer connected. But I did enjoy the heck out of it when I did get to watch it on tv. Your review of this movie is spot on, and I know if I never had seen it before I would want to now. Fortunately, there are two separate postings of it on YouTube. There were three, but one has been removed due to repeated complaints of copyright infringement. But, as of today, two remain. At least two anyway. I have them on my favorites list, and haven't yet looked for others. I have checked repeatedly through the listing on TCM and cannot find it on their playlist. One would think with their format, this would be right up their alley! But, I have also requested it several times as well. Thought I would pass that along to you in case nobody else has found it there and wanted to play it. It's full length postings in both cases ~ not in 15 minute bits and pieces like some others. Hi Sharid57, so glad you stopped by and enjoyed this post. It's nice to meet another fan of "No Down Payment," too. Good to know the film is now available as a full-length feature on YouTube. It was cycling on HBO for a while and occasionally shows up on other movie channels, but never on TCM that I'm aware of. Probably because it's a Fox film and there seem to be issues between TCM and Fox. Thanks for clearing up that discrepancy between TCM and Fox. I can certainly see where that would be an issue, now that I am aware of it. Just one more battle I didn't really know about. A shame really, since it would fit in so nicely with the rest of TCM's programing. I guess we'll have to be satisfied with YouTube, our own recordings, and whatever other rare broadcast events we can find. That too, is a shame. Odd I never noticed a mention of the fact that two of the cast, Jeffrey Hunter and Barbara Rush, weren't just cast mates ~ they were married from December 1950 until their separation and divorce in 1955. They had a son, Christopher in 1952. I'm not sure I was ever aware the two had been married, though I've always thought she would've been great in the role of Hunter's wife in "No Down Payment." He died tragically young (early 40s) but Barbara Rush is still with us and near 90 now. Barbara Rush's body language in that shot above fairly screams "territorial" with her backward leaning stance, looking down her nose at the pair in front of her, especially Jean, and her arms crossed against her body, as if to guard against any potential invasion of the sanctity of her home and marriage to Hingle. I wonder ~ could it be part of her character? Or an unguarded moment at the friendly "confrontation" by her former spouse in real life, Jeffrey Hunter? I found this notation regarding filming locations for the movie at IMDB. I thought it was interesting that someone tracked down this address for just one of the filming locations after all this time! Pasted directly as copied from their locations list. The other two listed were Pacific Palisades in general, as others have mentioned, and of course the movie studio. The street names seen are all off highway 39. They used one gas station in the Pacific Palisades but none of those houses are anywhere near there.